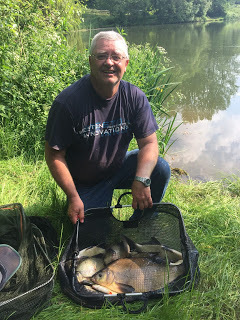 I arrived at the pub for round three and there were some more new faces fishing today in the shape of Adie Bishop and Rich S who I normally see at Summerhayes. 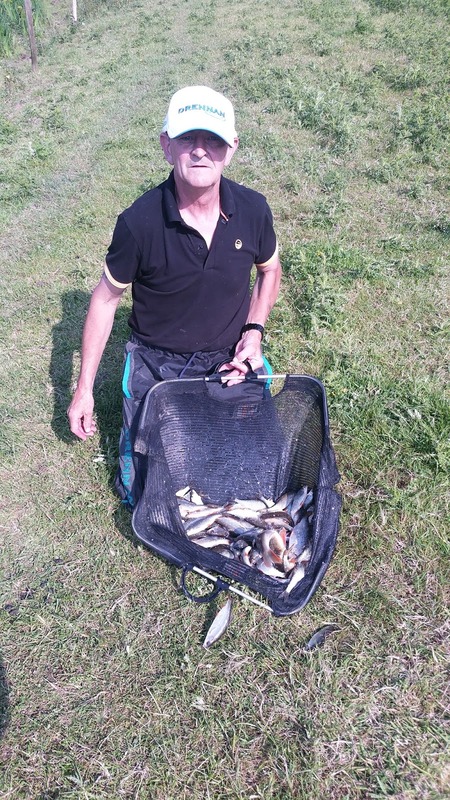 Rob was back from his holidays and Bob, Nick, Jess and John Dursley were all fishing after missing the last match although a few regulars were missing which meant we had a dozen fishing again. It’s actually probably a good thing that not everybody is fishing every match as we’d never fit them all round the pond! Rob announced the draw and I hung back hoping I could avoid peg 24 (although I needn’t have worried as it wasn’t in!) and really fancied a peg on the near bank (pegs 17, 18 or 19) but should have known better as Karl was on 19 and Rob in 18, well they do need to make good use of that WiFi they’ve had put in! 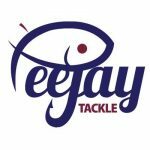 I pulled out peg 8 on the far bank and Jess was my next peg neighbour for the second week on the trot so some laughs would be guaranteed! Fieldy was on 17 and as I walked past he’d nearly finished setting up before I’d even got my gear round to my peg! 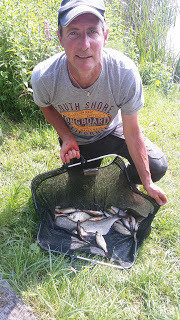 After two trips I finally got all my kit to my swim and set my box up before mixing some groundbait (Bait-Tech Pro Nat Bream and Thatcher’s Dark), todays rigs were a 0.5 gram Drennan Roach and a little Preston Chianti for fishing up in the water, both had size 18 Kamasan B611 (barbless) hooks to 0.10mm. Todays side bet club was Hurf, Rob, Steve P and me with Hurf on for a hat trick after taking the nuggets in the first two matches. Rob signalled the start and most people fed their poles lines before quite a few people (including Jess and John Dursley on peg 10) started on the feeder. 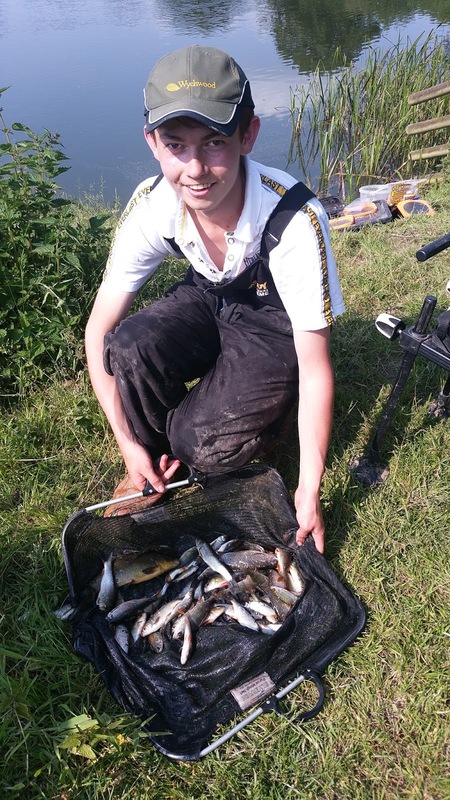 I cupped in two balls of groundbait at ten metres before starting with the deep rig and caster hook bait. The rig never even reached the bottom as a roach took the bait on the drop, I bumped the next couple of fish and it was already obvious the fish were up in the water. I stuck with the deep rig for the first hour and it was a bite a chuck with the majority of fish coming on the drop but the average stamp was on the small side. 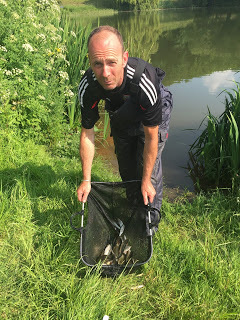 Even if the bait got to the bottom, the size of the fish didn’t improve and after sixty minutes I had 35 fish for around 2.5lb but with fish swirling for the loose feed I was itching to try the shallow rig. 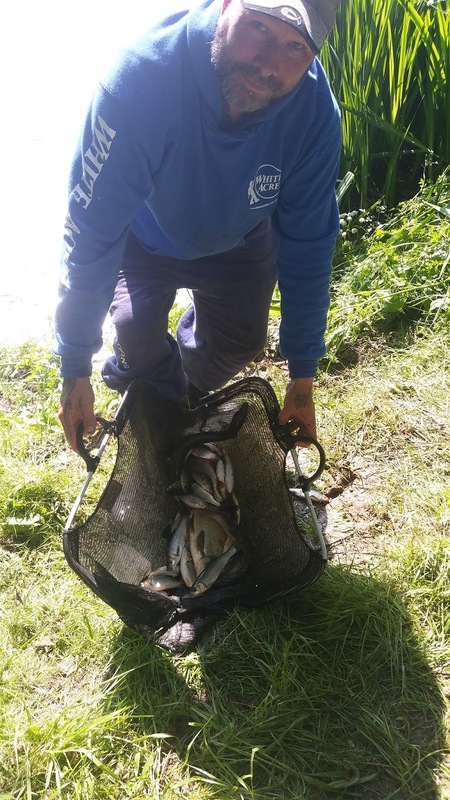 I could see Fieldy over on peg 17 netting fish regularly and John had landed a couple of pound skimmers but most people seemed to be struggling. I shipped out with the shallow rig and before I had time to feed, the float sailed away followed by my Drennan Aqua elastic as a decent roach bolted. 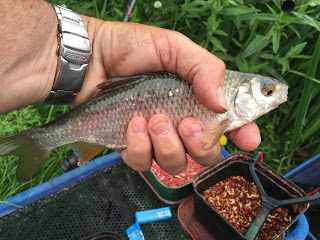 I netted a cracking roach and I hoped it was going to be the first of many. I had a few more but it wasn’t long before I started missing loads of bites and my catch rate slowed up. 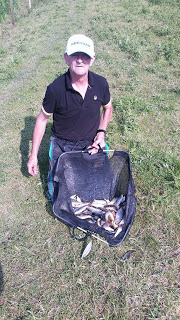 I only added 22 fish in the second hour but a better stamp meant I’d probably added another 2lb or to the net. In the last match I had 98 fish for 9lb 8oz which works out at around an ounce and a half per fish so if I could get to 160 fish it would give me 15lb which I thought wouldn’t be too far off the pace today. I started feeding another line at ten metres and swapped between the two but I was still missing way too many bites. The pond was flat calm which probably wasn’t helping much but I also thought it wasn’t ideal conditions for bream or skimmers either which hopefully would work in my favour (remember that for later!). I had 19 fish in the third hour but my catch rate was still going in the wrong direction, I tried laying the rig in and keeping a tight line and hooking the caster like a maggot but I was still missing loads of bites and it was doing my head in. Also after an overcast start it was now scorching and at times the pole would get so hot you almost couldn’t hold it, I’d also left my bottle of water in the car on the opposite side of the pond and despite my best efforts, Hurf wouldn’t go and get it for me! 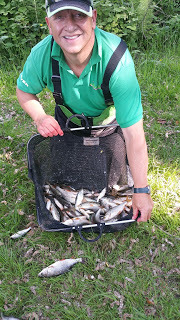 John now had four or five skimmers but there probably wasn’t much between us, Jess kept swapping between the feeder and the short pole and caught some nice roach on the latter but he also lost a couple of lumps. 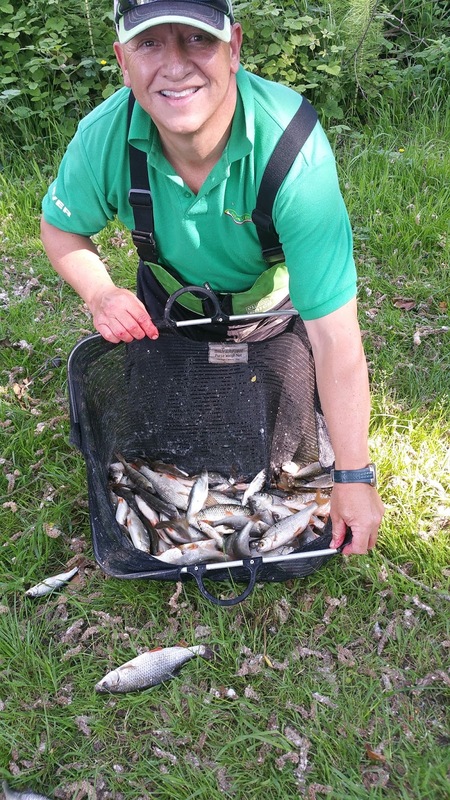 I was still catching roach along with the odd rudd and chublet but I couldn’t catch any quality and I was a long way off my 160 fish target. I went out to 11.5 metres which helped a bit but the fish were still on the small side. Jess hooked another lump and this time did well to land a big bream that wiped out my early lead and put him in with a chance of framing. John was still getting the odd skimmer and had seven or eight which wouldn’t be far off either. I had a nice 4oz hybrid or ‘zooner fish’ as Jess calls them! 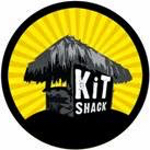 (ask him about them when you see him next). 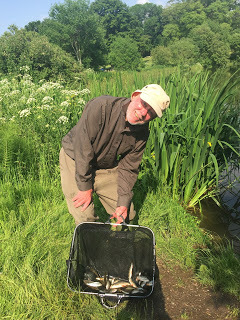 I reached 128 fish (which I thought would give me 12lb) with about 15 minutes to go, I bumped two better fish which didn’t help my cause and my final tally was 133 fish, as Rob called time, John shouted ‘Fish on!’ before slipping the net under a decent bream which he said looked about 4lb. I packed up and took some of my kit back to the car, thankfully my bottle of water wasn’t too hot and I walked back round to get some photos of the weigh in. 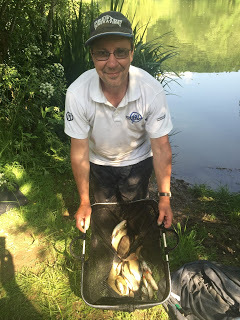 Rich on peg 2 was first and he had some nice skimmers and a good perch on the tip to weigh 6lb 8oz, then Bob had 2lb 1oz from peg 4 before we got to Nick on peg 6 who had 4lb 2oz. 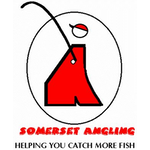 Jess had 14lb 5oz and we weighed the bream which was 5lb 2oz, a nice bonus! 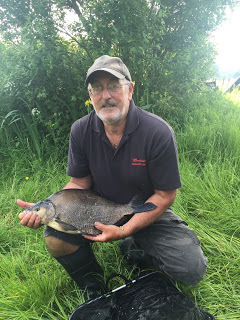 My fish weighed 11lb 10oz which was a little less than I thought and then we got to John and as it turned out he needed that last fish as he weighed 17lb 8oz to go into the lead and I’d been ‘bream battered’ on both sides! 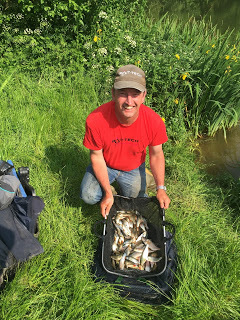 So another nice days fishing with loads of bites but I’m a couple of pounds shy of framing and I need to be able to sort out those better fish and hitting more bites would help! 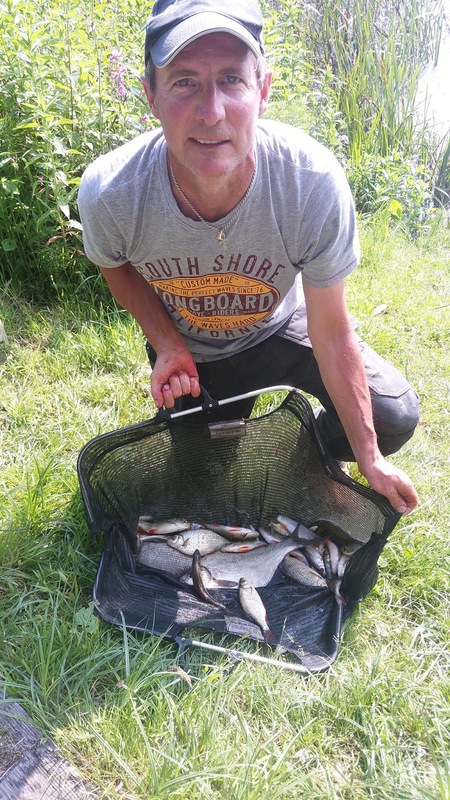 Also I can’t go without saying a massive well done to my Summerhayes travelling partner, Janders who won the match at Chard Reservoir with 55lb of bream from peg 1 on Sunday – well done mate!